CTET 2019 - All about Central Teacher Eligibility Test (CTET) ✓ Notification ✓ Application Form ✓ Syllabus ✓ Admit Card ✓ Eligibility ✓ Question Papers ✓ Answer Key ✓ Exam Date ✓ Exam Pattern ✓ Cut-off Marks ✓ Preparation Tips & more for the post Primary Teacher (from 1st class to 5th class) and Upper Primary Teacher (from 6th Class to 8th Class) examination to be held iN February 2019. Candidates interested in appearing for the exam should apply only through online process from official website of Central TET i.e. www.ctet.nic.in. The Government has Decided to Conduct The Central Teachers Eligibility Test – CTET 2019 Exam Once Again in the Current year to help more Number of Candidates to Apply for CTET 2019 The Central Government has announced the CTET 2019 Latest Schedule now. Online Application has to be submitted by accessing the following CTET website www.ctet.nic.in. The candidate should supply all the details while filling up the ‘On-line’ Application. After depositing fee in Bank, Candidates are required to take a print out of the computer generated Confirmation Page after successful submission of data. (if fees paid through Challan) and keep it for records and future reference if required. SC/ST/Differently Abled Person: Rs. 500/-. 1. A person who scores 60% or more in the CTET examination will be considered ‘CTET passed’ or ‘CTET qualified’. This will be the qualifying marks for all categories. Candidates will be able to download their Admit Card from 25.01.2019 onwards and appear for the examination at the given Centre through official website. Candidates are requested to visit the same website to download their Admit Card For Central Teacher Eligibility Test (CTET) Exam 2019. 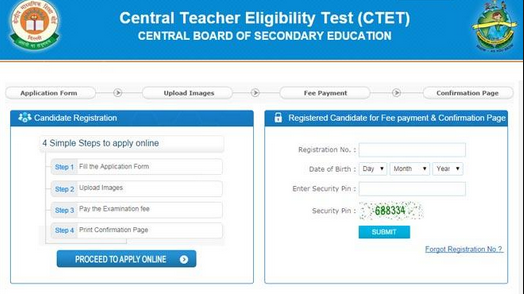 STEP#01: Log on to official website of Central Teacher Eligibility Test. to apply online for CTET. STEP#04: Fill and edit CTET 2019 online application form.